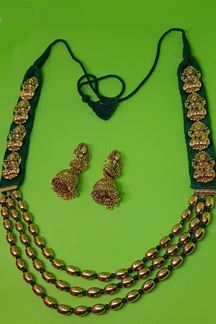 Don this majestic, Hand Crafted with much effort and care temple, Goddess Laxmi inspired gold peated pieces and small green pearls woven onto a bed of solid green threads along with matching earring! Note: Please note that the Free Shipping offer doesn’t apply to any products purchased under the Accessories section. Shipping charges will apply. Shipping charges will be waived off only if the product is bought along with any product under the following categories – Sarees/Lehengas/Suits/Gowns/Kurtis.